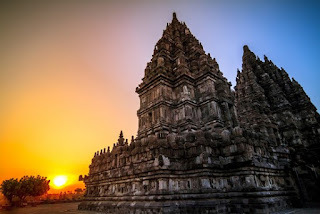 [DIALOGUE] The Legend of Candi Prambanan - Once upon a time there was two hinduism kingdom in Prambanan, Central Java named Pengging Kingdom and Keraton Boko. Pengging Kingdom leads by wise king named Prabu Damar Moyo. He has a handsome man named Bandung Bondowoso. 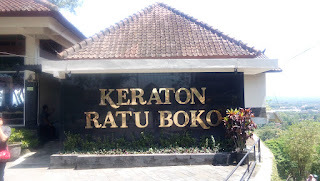 Keraton Boko leads by evil king named Prabu Boko. Prabu Boko has a beautifful girl named Roro Jonggrang. He has a giant governor named Patih Gupolo. Prabu Boko want to have control over Pengging Kingdom, so Prabu Boko and Patih Gupolo collected the power and supplies. After the preparation’s enough, Prabu Boko and his soldier went to Pengging Kingdom. Damar Moyo Guard : Who are you? and why do you come here? Patih Gupolo : We come from Kraton Boko kingdom, we want to take over the royal power of this Kingdom. Guards Damar Moyo : No, you can’t ! Before you face our king, let's face us first ! Prabu Damar Moyo : What's wrong with us so you want to take over the power of this kingdom ? Patih Gupolo : Never mind we just attack their king! Uprising ensued between the two kingdoms. Many casualties on both sides and people Pengging be suffering. Knowing people suffer, so he sent his son Bondowoso for revenge against King Boko. Prabu Damar Moyo : Oh my son .. Vengeance my revenge on the royal Prabu Boko, because of him our people become poor and hungry . Bandung Bondowoso : Ok my dad, I would do it for you. Bondowoso : Indeed not! I am Raden Bondowoso, Prabu Damar Moyo son of the royal Pengging. The purpose of my coming here want to avenge my father to the king of Boko. Prabu Boko : What's this? and who are you? Bondowoso : I am Bondowoso, I want to avenge my father to you because you have made my people be suffering. Bandung Bondowoso and Prambanan king fighting, and in fighting prambanan king had been dead by Bandung Bondowoso sword. Knowing Prambanan king death chief minister of king back to prambanan king ad tell roro jongrang what happened. Patih : Pardon me princess! Roro jongrang : What happened Patih, why you look so sad after back from the fight, Where is my father? Patih : I’m so sorry princess, Baka king…. Roro jongrang : Daddy, what happened with him? Do you bring bad news about him? Roro jongrang : Where’s my father? Tell me, where is he? Roro jongrang : what do you say? Are you sure that my father was dead. Patih : Yes, princess! I saw bandung bondowoso stabbed him with his sword. When roro jongrang crying, Bandung Bondowoso come forward to her, he thought, who was the girl in front of him? Bandung Bondowoso thought that this girl was baka king mistress. Bandung : What happened with you sweet heart? Bandung : Hahaha who am I ? You don’t know me, I am a king. I am Bandung Bondowoso, hahaha, you look so beautiful, will you marry me and be my wife? Roro jongrang confused for answering his question. She thining what she will say to man in front of him. And after a minutes, she deciced to say something at her heart. Roro jonggrang : Bandung Bondowoso is supernatural power man, it’s impossible if I refused him. But I don’t love him. I don’t know him, but he wanna marry me?! Impossible!! He made me lost my father. Bandung : Let’s accept me, I’m not too bad, I am so handsome, why don’t like me? Do you shy with me? What should I do for you? Roro jonggrang : Make my father alive and than I will accept you. Bandung : What ? Its impossible Roro, your father is a bad man. Would you give me requirement a little easier? Roro jonggrang : Like this, if you really want to marry me, make me 1000 of temples in a night, if you success make it you may marry me. Bandung was shocked. He thinking about Roro Jonggrang. Bandung : Hahaha you’re kidding, 1000 temples in a night? What will you do with 1000 temples? How if I make you 10 temples only? Roro jonggrang : No…!!! I just want to 1000 temples, just do it if you love me. Bandung : ok. I’ll proof you if I love you, I’ll make you 1000 temples in a night, I promise. Bandung Bondowoso asked his jin, who had been subjected by him for help him. Jinny 1 : What happen Bandung ? Why you looks so panic? Bandung : I need your help jinny, I wanna marry Roro Jonggrang and she give me a requirements. Jinny 2 : What ? what can we do for you? Jinny 1 & 2 : okay Bandung, we will make the temples now. So they began to make temples, in another place roro jongrang so confused about it. Roro jonggrang : How is it, bandung follow what i have commanded?! Dayang : Of course princess, he can do it because bandung is a supernatural power man, certain he fulfill your requirement make 1000 temples. Now 2 o’clock and he will finish it princess. Roro jonggrang : so, what should I do ? I wont marry him. He is not handsome , really I don’t like him. Dayang : So, how princess ? What can I do to help you? Roro jonggrang : Please make all prambanan people up, asked her for pound rice, burn straw close to the chicken cage. We make as if morning come. So, the jin will think that morning will come soon, of course they will escape, don’t forget to spread all kind of flowers. Roro Jonggrang : yah dayang lets do it, don’t make it late! Dayang call the Gadis in village. Dayang : Hey Miss.. Follow me.. Girl 2 : what should we do ? We are very sleepy, may I back to sleep?? Dayang : No. Like that, now you pound rice, burn straw close to the chicken cage. We make as if morning come. So, the jin will think that morning will come soon, of course they will escape, don’t forget to spread all kind of flowers. Girl 1 : for what ? what happen to Roro and why we have to do it? Dayang : I can’t explain you now. Just follow my command Miss..! Girls 1 & 2 : all right Dayang. Meanwhile, all of the Jinnies were made a temples. They didn’t check the time. So, when the sunshine comes, they thought the morning was come already. They were panic at that time. Jinny 1 : Guys !! Look the sunshine over the east. Jinny 2 : What ? seems like it just a few moments. That’s odd..
Jinny 1 : We have to go know, if we stay here our body will burn by sun, weleh weleh. Jinny 2 : But how with our work, one temple we haven’t make it. Where is bandung bondowoso, we should be tell him about it. He will angry with us. Jinny 1 : I don’t care, I should go know, let’s go guys..
After that all of Jin disappear and Bandung Bondowoso come in. He came to Roro Jonggrang. Bandung Bondowoso : Roro Jongrang! I have fulfill your requirement, please marry me! Roro jongrang : really, you have successfull to make it? Are you sure? Bandung : Yah of course my darling. Bandung : Don’t you believe me? Let’s see and count that temples. Roro jongrang : Ok, but remember with your promise, if the temples are not 1000, you don’t marry me bandung. Roro jonggrang : sorry bandung I have account the temples but the temples you have made less one. Bandung bondowoso : Hah, are you serious? You do ot passé in math exam, you’re wrong, I don’t believe you, and I’ll account it again. Roro jongrang : Sorry bandung I have accounted it more than 10 times and I think the temples are only 999. Bandung bondowoso : Ok, only one temple, and I have made 999 temples, so I think I’ll make it for you, after we married. Roro jongrang : No, bandung. That this not our agreement, you have failed bandung, don’t come to my palace anymore. Roro jonggrang : ya, so what do you want? Tell to me that you lose, Bad man. Bandung bondowoso : Jonggrang!!! Do you brave to mock me!! Bandung bondowoso : Jonggrang! You make me angry. I have try to be patient to get you but its useless. No problem I’m not marry with you! But the temples less one and I think proper complete the temple is only you jonggrang! Be a Jonggrang temple as my king decoration. And at the last, Roro Jonggrang turned into the statue as the temple’s decoration. This story has a sad ending. Bandung was lived as a devil king. Until the end of his life, he still loved Roro Jonggrang and always waiting for Roro Jonggrang even he was not married another girl.